Dave Clements and I, with other collaborators, took the data on which this image is based with the X-ray telescope and CCD camera on board the Chandra X-ray Observatory spacecraft as it was flying 140000 kilometers above the Earth (about a third the way to the Moon). The exposure time was 15 hours and the focal length of the X-ray camera is 10 meters. The image shows the galaxy Arp 220, which is 240 million light years (2.4 billion trillion kilometers) away. The galaxy is 60 thousand light years (600 thousand trillion kilometers) from end to end. We see hot (ten million degrees) gas, some falling into black holes (blue pointlike objects) and some (red areas) in a huge wind flowing out from a region where two galaxies have collided and merged in a 100-nonillion-gigaton explosion. 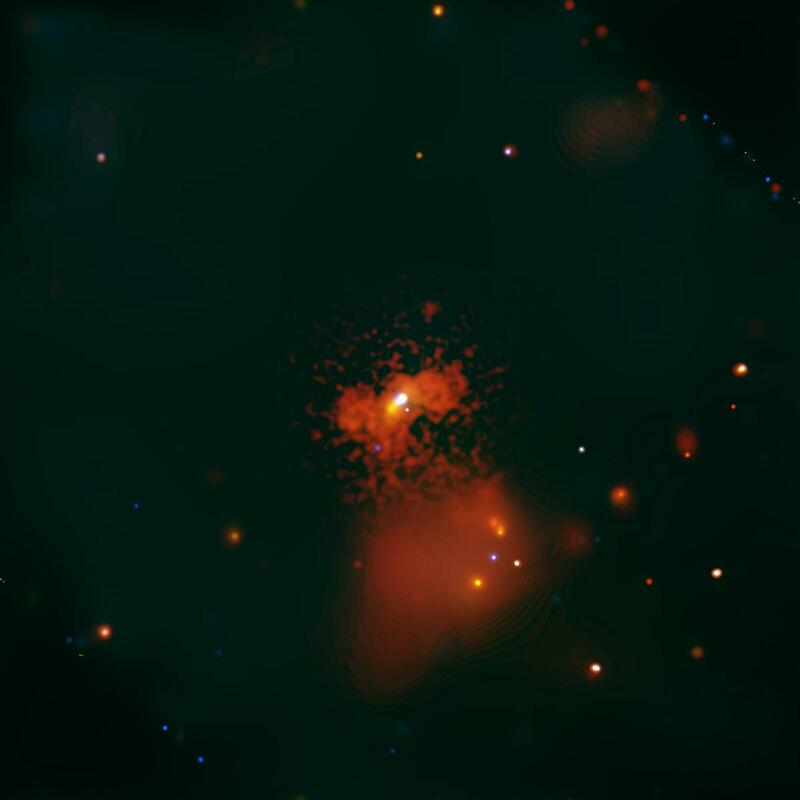 Toward the lower part of the picture, an even more distant cluster of galaxies is embedded in a dim (large red) cloud of its own hot gas. The blue, green and red colors correspond to light with wavelengths of 1.2 to 6, 6 to 12 and 12 to 40 Angstroms respectively. Compare this with visible light which runs from about 4000 to 7000 Angstroms: I have shifted the color scale by a factor of around 500 to make it visible to human eyes. The science of this image: we are trying to understand how galaxies evolve, and an important part of that story is that galaxies hit each other and often gobble each other up; these intergalactic train wrecks send shock waves through the gas in these galaxies and trigger the formation of new stars. By studying the X-rays from these events we can distinguish between different theories of how the different kinds of stars get made. A less artistic version of this data was used to measure the temperature of the gas in different parts of the galaxy, and was published in the Astrophysical Journal: McDowell et al 2003, ApJ vol 591, p 154. The art of this image: I used a larger field of view than normal to emphasize the isolation of Arp 220 within the black, empty field of space around it. Travelling at the speed of light, it would take you half a million years to voyage from one side of the picture to the other, and you can see that most of that space is empty. Figuring out how to represent different colors of X-rays, all invisible to the human eye, involved some careful choices. I also wanted to bring out the faint, smooth, sedate glow of the southern cluster (the egg-shaped red blob in the lower part of the image) and contrast it with the dynamic, contorted and complex shape of the exploding galaxy (the blotchy mess in the center), and it required some fancy footwork to make both visible at once. Technical details: We radioed instructions to the robotic orbiting telescope to tell it to point at Arp 220. The individual X-rays were measured on the spacecraft, and their properties were radioed back to Cambridge. We figured out where the telescope had been pointing and constructed the image using a standard set of software, and then started on specialized work to make this artistic version of the data. The image was processed to remove cosmic rays, bad pixels and other blemishes, corrected for pixel-to-pixel differences in sensitivity on the camera, and reconstructed to remove blurring due to the motion of the spacecraft pointing direction. It was then split into three color bands and adaptively smoothed using an algorithm by Harald Ebeling. The color balance and stretch was then manually tweaked to bring out fine details. Two different smoothing scales were used in the red band: a short one for the galaxy and a long one for the southern cluster; the two reconstructions were then blended with a distance-based gaussian taper. I thank the other members of the CXC and the CIAO team for making the spacecraft which allowed us to make this observation and the software which allowed me to make this artistic representation of the data.